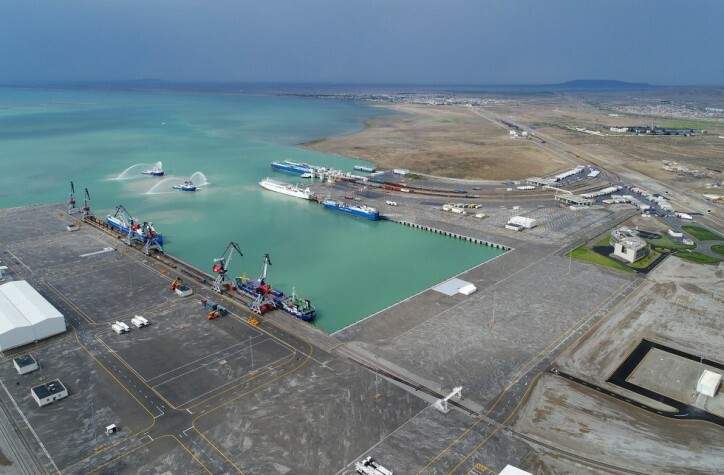 Minister of Economic Development and Trade of Tajikistan Nematullo Hikmatullozoda met with the Director General of this Port Taleh Ziyadov earlier this month as part of his visit to Azerbaijan. Delivery of Tajik cargo to the Middle East or goods imported from this region have been transported by the Caspian Sea for almost two months: using the ports of Baku and Aktau (Kazakhstan). The Baku International Sea Trade Port in Azerbaijan’s Alat settlement is expected to become one of the leading trade and logistics hubs of Eurasia. The New Port in Alat is a transportation hub linking the west (Turkey & EU), south (Iran & India) and north (Russia). Situated in the vicinity of the regions of Azerbaijan, it will also increase its connectivity as an efficient hub and so increase the volume of cargo being handled. In addition, new port location is linked to existing highways and railways, connecting the port to the inland regions of the country.